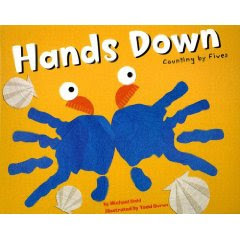 My daughter picked up the book "Hands Down: Counting by Fives" by Michael Dahl from our library. She loved all the fun pictures made from hand prints. We decided to try our own. 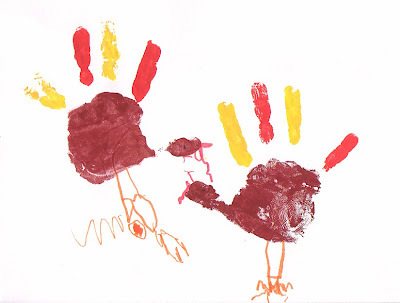 I thought the easiest way to do this was to just have my daughter paint her own hand. She thought it was great. She did both her left and right hands and then added the beak, gobbler, eye, and feet once it was dry. good idea to paint the hand! More color possiblities that way! that is a good idea! She's so creative!